How the Green Lantern movie could have become a box office success. Now that’s a slogan that would have brought attendees to movie houses in droves, should Warner Brothers’ marketing division only have dared to use it. Of course, that would have required a slight rewriting of the film to facilitate its use, but I think we all agree a rewrite for the GL film would not entirely have been out of order. Happy Sixth (Give or Take A Year or Three) Birthday to Bully, The Little Stuffed Bull Who Apparently Ages Like Jonathan Winters on Mork and Mindy ! Comic Book Galaxy is going off the air within a week or so, so if you’re gonna catch up on any articles there, now’s the time to do it. I wrote there for a while (I’ll repost the articles on my own site here, soon), plus I contributed this little blurb about the Thing (in relation to a still-MIA Barry Windsor-Smith graphic novel) which I think is one of my favorite things I’ve ever written. Thanks for asking me to contribute, Alan! And now, your Indian-style Swamp Thing promo poster for the day, celebrating Charles Soule’s run on the series. BRB, going to India to get one of these. The Green Lantern movie would have been a hit if it had G’nort. Possibly some other GLs as well, but mainly G’nort. Emerald Dawn II would have been a hit if it had been called ‘Emerald Dawg’ and been about G’nort. After Earth would have been… aw, you get the idea. The tagline is pure gold for sure, but I know in my neck of the woods that a drunk driver protagonist would be DOA at the box office. Wasn’t EMERALD DAWN II so bad it was retconned very soon after it finished, or am I misremembering? I’d buy the movie soundtrack if he and Michael James Vincenzo Gubitosi were cellmates. Tim – Unfortunately it was canon for quite a while, but I don’t know about now. As bad as the drunk driver Hal concept was, EMERALD DAWN II is a good read. Gerard Jones and M.D. 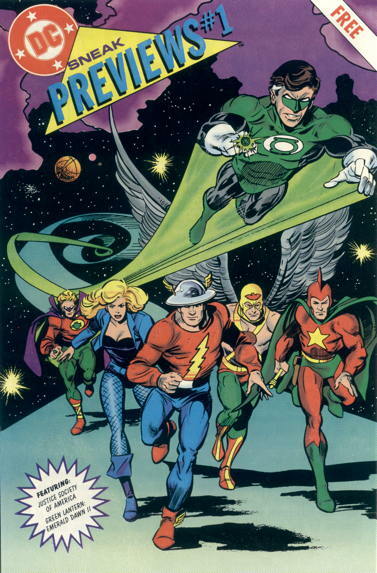 Bright did some excellent work on it and the GL ongoing in the 90s.